i LOVE this wreath elise made from shoe boxes. it's so cute i can't stand it. i'm definitely making it next weekend. 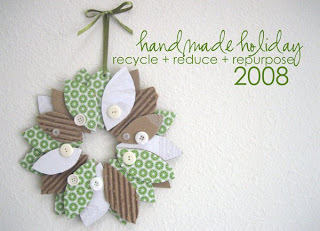 i think i'm also jumping on board the handmade holiday 2008. money will be especially tight since i lost my job but there are so many wonderful handmade things to give. a few weekends ago i made granola and bread that i think i can perfect into perfect holiday gifts as well. so exciting!